It’s that time of the year again for apple harvesting, as we approach the changing of seasons and rhythmic flow of cycles. It sure isn’t feeling like Autumn around here right now however, with crazy heat in the 90’s. I’ve been noticing when out and about, how plants and blooms are doing odd things with all these global shifts in weather. Are the natural rhythms being completely thwarted in mirror to a large portion of the collective being out of tune with nature and/or messing with it, thinking they know better? Or is it that everything is learning to cultivate a reality of its own new rhythm of free will, in a world that has opted out of that choice? Perhaps it is all of these and then some. There are many ways to interpret things indeed and I’m constantly reflecting on it all. However it may be, the apples seem to still be in their natural cycle, ready to be gathered, and so that is what I focused on. The tree is much smaller than the ever-abundant tangerine, loquat, and persimmon here, however it still yields a beautiful little bounty. 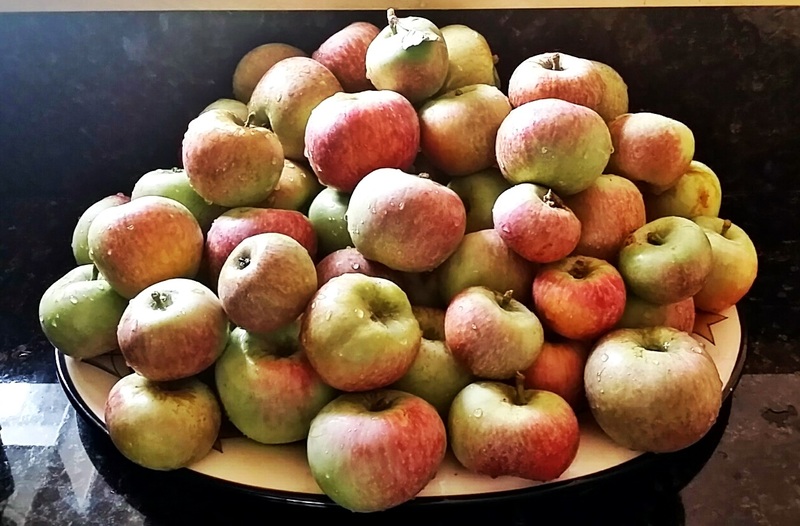 And this year that came in the form of 66 sweet little apples. So there will be a lot of apple creations over the next week or so, as I explore some ideas for some easy vegan apple goodies. 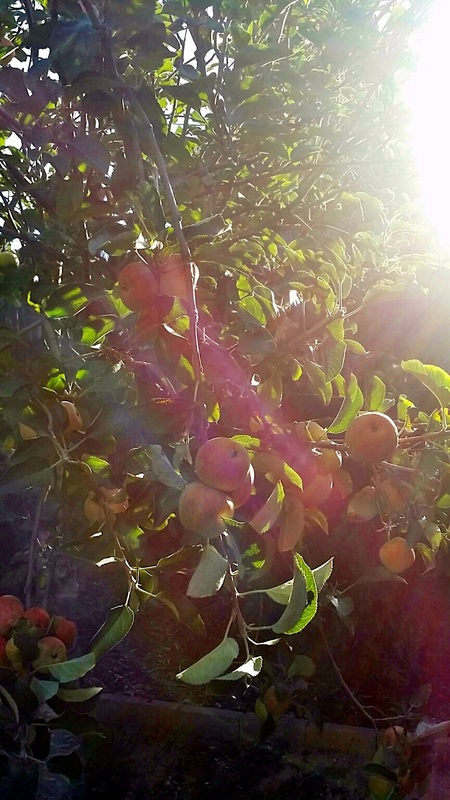 Apples and apple trees symbolize love, truth, peace, beauty, honesty, remembrance, honesty, purity, knowledge, wisdom, joyousness, fertility, abundance, and earthly desires. And I found it quite interesting to receive 66 of them – a spiritual master number of love – unconditional love. I t is also a master number for faith, healing, and deep trust in the Divine. Not to mention carries the energy of transmutation and expanding consciousness, sometimes in the form of Kundalini awakenings. It also infuses a sense of sacredness to the seemingly trivial daily experiences with the desire to search for deeper and larger meaning to it all through meditative contemplation. The number 6 on its own brings the energy of humanitarianism, service, home, simplicity, and grace, while focuses on the material in life and daily needs, reminding you to balance the physical and spiritual aspects of your life. And when you see how the two are connected, then by living with conscious intent, you will find yourself always provided for while serving your life mission. Basically, live the truth of your essence and all is well, without need for fear, worry, and anxiety. It also imparts a message that you give love freely and unconditionally, and this source of enjoyment in relationships is important. When you see a number repeated, it doubles and amplifies the essence of its energy in its individual state. Yep, that all feels very personally appropriate as messages. And it’s interesting that the apples and the number 66 embody very mirroring vibrational energy. 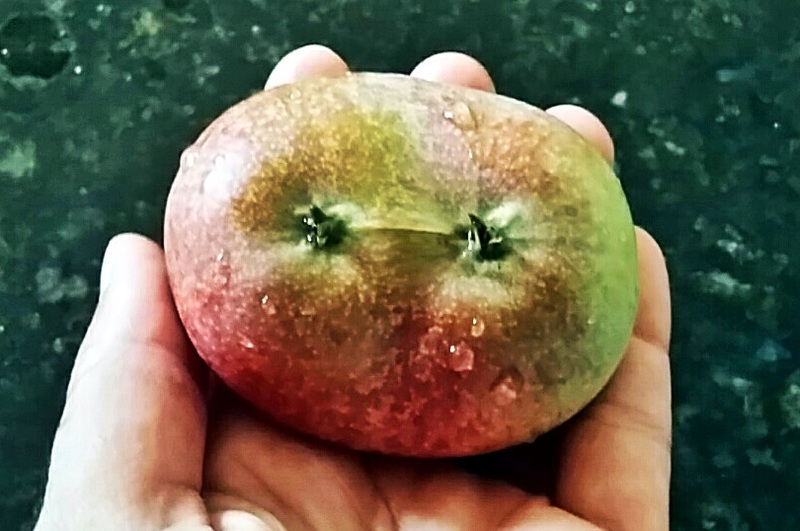 I also found this little one here to be quite a fascinating discovery among the 66 – a twin apple! Two apples growing from one and so perfectly balanced. Seemed to be reflecting that unifying of divine parts within self that create wholeness. Also speaks to twin soul energy. In addition, it could be symbolizing the birthing of something new from the pure essence of self, and that transmutational energy in process of alchemically shifting. There are always so many layers to the simplicity around us. Very fun to explore, but even more meaningful when you start to connect the dots and see the story weaving in and around you. You are never alone, as a constant dialogue of support is connecting with you daily. Posted on September 17, 2014, in Uncategorized and tagged 66, angel number 66, apple harvesting, apple symbolism, apples, master number 66, master numbers, meaning of 66, numerology, twin soul. Bookmark the permalink. 13 Comments. yay! 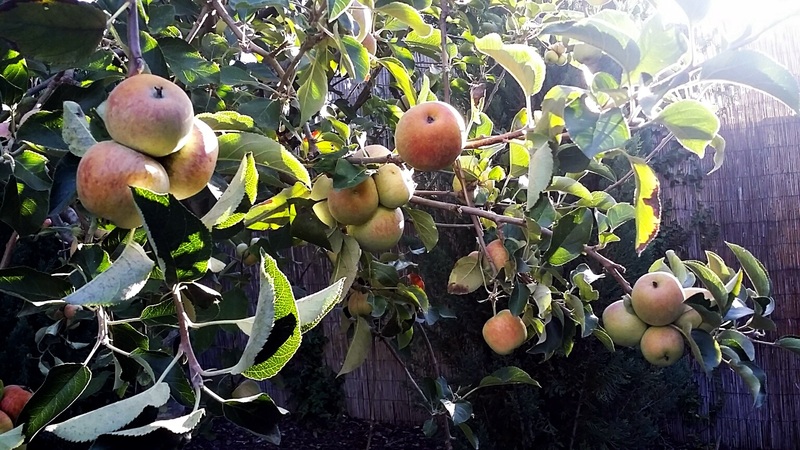 yes, it’s fun to have the fruit trees. i love their ease of care as well 😉 weeeeeeeee avalon! good point!! xoox!! i agree! and a lot has been flooding in, as we move through our shifts. glad you enjoyed the virtual apple pie 😉 xoox! The story behind how I got him back is what is really extraordinary as well as how the video turned out. Why I shared it with you on this site is because the number 66 and it’s connection with angels is evident in my video. If you noticed as I’m juggling my cellphone from left to right hand I inadvertently pause on an enclosure door with the number 66! It’s also clearly evident as I’m gently putting him in his carry cage. I’ll post the full story for you to read as well it will blow you away! Joey went missing from my home after he was accidentally let out. Being an exclusively indoor cat I held little hope for his survival as he had no idea of the dangers of cars, dogs and people. I could only hope that someone had taken him in and was looking after him so I eventually decided to arrange with a Siamese breeder to get a replacement kitten. Miraculously in spite of being lost for nearly two and a half months in a busy suburb of Melbourne he turned up at an animal shelter relatively unscathed (although a little thin) what made this even more amazing it was the exact day I had travelled 200km to pickup the replacement kitten and was on my way home with him when I received the news about Joey! I went to the shelter the next day but was shocked to see how much weight he had lost! He was also clearly very stressed and depressed as like myself had given up hope of us ever seeing each other again! The joy and relief in his meow was evident when he heard my voice and his name spoken for the first time in more than two months! I made this video of his return to me as a record of the event. This is where the second miracle occurred as I decided to dub some music into the video done for a documentary called Miracles about people who escaped certain death relatively unscathed. The music was supposed to be the merciful song of guardian angels. Anyway it failed to kick in at the beginning of the video as I originally intended instead started at the very moment Joey heard my voice and realized he was saved it then followed through to the end of the video as if written and performed for this very moment!? When I got him home he was at first overjoyed to be back but then horrified to find the new kitten in his home. But within a few days he had excepted the new kitten and started playing with him “the two of them are now inseparable!” It makes you wonder if there are higher forces that watch over us and even animals as well!? The moral of this story is “never give up hope as miraculous things can happen” also have your pets microchipped I would never have seen Joey again if I hadn’t done so! Many have asked me where I sampled the song of the angels from here is the link to the miriacles series (exact episode) where I got it. The story itself is about a true miracle and was done several years before Joey was even borne yet for some reason the song melds in perfectly!!! ?